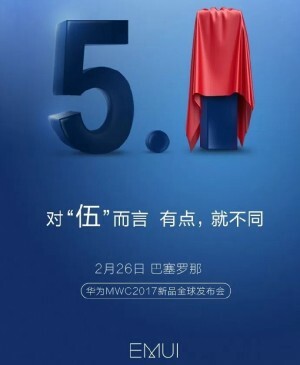 This Sunday, on February 26, Huawei is holding a pre-Mobile World Congress event in Barcelona during which it will unveil its latest flagship smartphone duo - the P10 and P10 Plus. A new smartwatch will be starring in the show too, but that's not all. The Chinese company has posted the teaser image you can see to the left on its Weibo page. It tells us to expect a new version of Huawei's software layer atop Android to make an appearance at the February 26 conference too. EMUI 5.1 will follow the recently released EMUI 5.0 based on Android Nougat. For now it's unclear what enhancements the new version will bring, but it's probably safe to assume that the P10 and P10 Plus will be the first devices to ship with EMUI 5.1 preinstalled.